Investing in Farming in Kenya: The following feature was first published in the Smart Harvest journal. Investing in Farming in Kenya: It is no secret that Ukambani does not receive much rainfall. For this reason, not much farming goes on in the region – not unless one is impassioned to do so. This must be the case for Robert Kieti, who was not deterred by the dry and hot weather in his county, Machakos. The spirited crop and livestock farmer started small by buying seedlings from Jomo Kenyatta University of Agriculture and Technology in 2006. With a little prayer, he planted them and crossed his fingers. “I started farming with 20 mangoes, 60 oranges and 20 tissue banana seedlings as a hobby, as a way to keep myself busy on days l travelled to the village. Then, I was based in Nairobi, where l worked as an insurance agent,” Mr Kieti says. At this time he did not want to do serious farming: he would plant just a few fruit trees and keep a handful of livestock for home consumption. But the fact remained that he loved nature, especially seeing plants grow. Mercifully, the rain that came once in a long time would be a big boost to his crops. He would harvest and store some to use for irrigation at a later date. With time, the farmer increased the number of seedlings on his farm, in the process introducing pawpaws and livestock. Today, he boasts three dairy cows, four heifers, 80 pigs, 400 mango trees, and over 200 orange and pawpaws trees in his farm. He also rears several goats, chicken and rabbits. 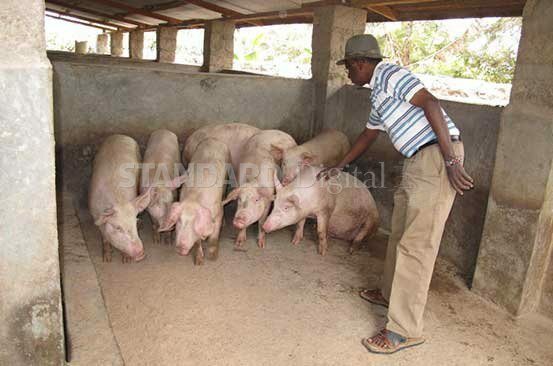 On doing the maths, Kieti says he has invested more than Sh800,000 in his farm, with the most expensive venture being pigs, since he put in close to half a million shillings to buy piglets as well as construct their pigsty. “I am planning to settle into commercial farming, and this is why l am investing heavily in water. The drilling of the bore is going to cost me over a million shillings but l want to end any water challenge in future,” he says. Kieti says he has been farming without any agricultural expertise. “I was raised in a family that hinged on farming, therefore the knowledge l have been applying is what l acquired during my childhood, and perhaps the agricultural knowledge l got in school back then,” he says. But since he is now venturing into commercial farming, Kieti says he is already researching and reading tonnes of literature on farming. Meanwhile, he says he has learned a lot from Farmers Choice and the Kenya Agricultural Research Institute. Although he has had a good harvest from his farm in the past, Kieti however cannot quantify how much income he has made from his produce. “I have never calculated the proceeds, but it has helped us buy what my family and I need for home use and enabled us keep aside some extra income,” he says. He avers that after completion of the borehole, he will be more settled in his venture and hopefully start computing his proceeds in five years. But the going has not always been smooth. Apart from rain scarcity, his other main challenge has been taming workers in his farm. He laments that their work ethic is sometimes wanting, and especially when he is not around. “At times they would not realise when an animal is on heat or is diseased,” he says. This has forced him to make regular trips to check on his livestock and crops. He observes that if the Government wants to tackle food security, it must employ and dispatch extension officers to surrounding areas to advise small scale farmers on best farming practices. Kieti reveals there is high demand for milk, because drought has scared many locals from farming due to unavailability of feeds. Investing in farming in Kenya….